Viorica Dăncilă: Good afternoon! 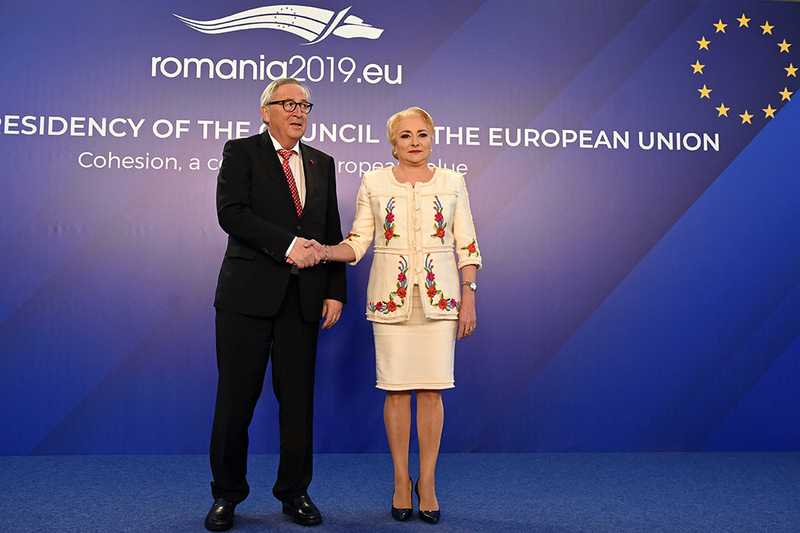 I welcome the presence in Bucharest of Mr. Jean Claude Juncker, President of the European Commission, the presence of the College of Commissioners in a particularly important moment for our country, awaited by us, the opening of the Romanian Presidency of the Council of the EU. The Romanian Government’s visit to Brussels, last december, represented a good opportunity for strengthening our cooperation. It is their turn, of the College of Commissioners to visit us in Bucharest and to deepen the discussions on the concrete priorities and objectives that we have set for this semester of the Presidency. At the same time, today’s visit is also a symbolic moment for Romania, it paves the way for our cooperation in a new perspective, that of presidency of the Council of the European Union. In this capacity, we will continue to work together to attain the common objective of strengthening the European project. On today’s meeting with President Juncker, I reiterated my confidence in close co-operation and a constructive dialogue in continuing our good cooperation with the European Commission in recent months. I also voiced hope that our joint efforts and mutual support will make it easier for us to attain the desired results by the end of our presidency of the Council of the European Union and, of course, by the end of the mandate of the current European Commission. The European Commission’s constant approach and initiatives for achieving a stronger and more effective union in order to deliver concrete results for the benefit of all the European citizens fully fits the vision and objectives we want to promote during our presidency of the Council of the European Union. I assured President Juncker that we will maintain this approach. We are fully aware of the stakes, especially in this changing European landscape, and we are firmly committed to contributing, as a facilitator of consensus, through concrete actions, to the promotion of a more united and cohesive Europe. An approach of this kind is needed, all the more so as we manage a European agenda with actual topics with a very high level of complexity. Debates on the Future of Europe, future elections for the European Parliament, negotiation of the Multiannual Financial Framework 2021-2027 and the Brexit are just a few elements and major events that define the framework for action of our Presidency of the EU Council. I assure President Juncker that we are determined to contribute to positive results delivery, to strengthening EU unity in order to meet the current challenges facing the European Union. We are both realistic and pragmatic. We are holding the Presidency of the EU Council before the end of term of the European legislature – it will be the last presidency before the European Parliament elections in May, the last presidency before the end of the current Commission’s term of office- and we will focus on ensuring the continuity of the European agenda and providing the bases for moving to the future European Parliament and the future European Commission. Today’s discussions between the members of the Romanian Government and the members of the College of Commissioners were structured on three thematic clusters, which took place in parallel and provided the opportunity to deepen the priority dossiers on the European agenda. During the first thematic cluster on the Internal Market – Growth, Competitiveness, Innovation and Digital cluster, a number of dossiers and policies were addressed under the objective of strengthening the Internal Market of the European Union. This objective is one of the most important milestones of our joint action. We addressed issues related to the long-term vision of the Single Market and the industrial policy, the advancement of Erasmus programme negotiations or the mobility package, as well as legislative initiatives aimed at completing the Digital Single Market . Talks within the second thematic cluster covered aspects related to economic and social Convergence, cohesion and inclusion, with emphasis on sectorial dossiers aimed at strengthening the Economic and Monetary Union, implementation of the European Pillar of Social Rights and promotion of mobility and free movement inside the EU Internal Market. A special attention was extended to talks on the future Multiannual Financial Framework 2021- 2027, one of the priority dossiers of the Romanian Presidency of the Council of the EU, taking into account its importance for the future of the Union and European policies, such as the common agricultural policy or the cohesion policy. The third thematic cluster focused on Europe – global actor, defence, EU security, migration and justice. On this occasion, it was underlined the fact that the advancement of the enlargement policy, the active involvement of the Union in the Western Balkans region and maintaining the attention extended to Eastern Partnership will represent priorities of the Romanian Presidency, during its mandate. It has also been reiterated the need to continue efforts to identify consensual solutions to the challenges of the migration phenomenon, including by shaping an upgraded asylum policy at EU level. As regards security within the EU, we will continue to consistently work on strengthening external borders and implementing the EU’s internal security instruments. We will also have a plenary luncheon between the members of the Romanian Government and the members of the College of Commissioners in the continuation of the thematic discussions, which will provide the opportunity to review the main conclusions and ideas emerging from today’s dialogue. We will also seek to identify the best ways for advancement and result delivery on all these levels of action. I underlined the fact that Romania meets all the technical criteria for accession to the Schengen area and that we want a political agreement to be obtained in this respect during the six-month rotating presidency. On my behalf and on behalf of the entire Romanian Government, I want to thank once again Mr. President Juncker and the entire College of Commissioners for your openness, for the constructive dialogue and cooperation, a very good cooperation to date and which I hope we will have the opportunity to further develop over the next six –months. Jean –Claude Juncker: Mrs. Prime Minister, ladies and gentlemen! I am running from one press conference to another and all morning I asked myself the following question: what am I going to say at the next press conference, because at the first, I already said all that was to be said. Well, first of all, I will say that we, the commissioners, have been treated like princes here in Bucharest. Everything is perfectly organized, which is auspicious for the continuation of events. I have had a bilateral discussion with the Prime Minister. It is the fourth bilateral meeting that I have had with the Prime Minister in recent months, which shows that I am very interested in what is happening in Romania and, of course, in what is happening at European level. When the Prime Minister presented the priorities of the Romanian Presidency, you could see that it was about a work programme that perfectly matches the intentions of the Commission. Therefore, from this point of view, technically, there is absolutely no difficulty in the relationship between Romania and the Commission. I would like to insist on several points. First of all, if I could express a wish, it would be that Romania joins the Schengen area during the mandate of this Commission. I see no reason why some Governments obstinately refused this. We keep in touch with the most recalcitrant and we try to persuade them to say yes to Romania’s accession to the Schengen area. In 2014, I pledged before the European Parliament to end the cooperation and verification mechanism and I remain faithful to this promise, provided all efforts are made at national level, and at European level, for things to run in good conditions. I would like to conclude my term of office making Romania a member of the Schengen area and putting an end to the Mechanism of Cooperation and Verification. It is a busy work programme related to the proposals made in recent years, the co-legislators still have 248 legislative proposals which are not yet finalized and, under the Romanian Presidency, together with the European Parliament, I would like to try before the European Parliament goes into recess, before the elections, and before April 18, I would like most of these … or an essential part of these legislative proposals to be adopted in co-decision by Parliament and the Council. Prime Minister told me many times that she intends to speed up the work at legislative level. There is very little time left, because the European Parliament will finish its works on April18, and little can be done on a legislative level between April 18, and the end of the presidency. Therefore, we will have to make the most of the few remaining weeks up to European elections for the advancement of the legislative programme. Likewise, with respect to the Multiannual Financial Framework, after an Austrian presidency that did a remarkable job at the technical level, the Romanian Government should lead the works so that progress is achieved as quickly as possible in this dossier. I know from experience that this is one of the most difficult dossiers a presidency can handle. Because I went through this process, I know how tough this task is. I would also like that during the Romanian Presidency too, we adopt at Council and Parliament level, some directives on migration and asylum. We proposed seven directives; five are pending completion, and I hope we adopt at least these fives, putting aside the two more difficult ones. But if we want to combat secondary movements, we need the Parliament and the Council to adopt the respective directives. This applies to the external borders defence too. The Commission made a proposal saying that the number of police officers and coast guards should reach 10,000. We are told now that it is not possible, but at the beginning, we were told that the Commission was too modest in its proposal, too shy. I hope the Romanian presidency speeds up works, and we should not let ourselves be diverted from our path by those who have a multitude of good ideas but when it comes to implementing them, they withdraw from the necessary debates. This is my third visit to Romania since the start of my term of office, and I would like the domestic issues and disputes from Romania to stop. When you preside over the European Union, you have to forget, and to put aside the internal policy issues. And the Prime Minister has confirmed us that the Romanian Presidency of the Council of the EU will not be shadowed by other issues. I have full confidence in Mrs. Prime Minister’s ability to lead the works of the Council. I know she is fond of European ideas, ideals. Therefore, Viorica, I trust you shall do whatever it takes for Europe to achieve progress. Thank you! Reporter: Good afternoon! One question for Mr. Juncker: how worrisome are in your view the anti-European messages which appeared lately in the Romanian space, and what can do the European Commission on the one hand and the other European institutions to combat them and what should the Romanian authorities do to prevent these messages from generating a wave of euroscepticism? The same question for the Prime Minister: what should be done in order not to have anymore anti-European messages and to avoid the consequences of these messages? Thank you! Jean –Claude Juncker: The Romania Government knows it and the Romanian people will find it out soon that we need to work together with the Romanian Presidency like in an ideal couple and I am sure that the Prime Minister will contribute to this to a great extent. I am never surprised when the Commission is under attack, that is the rule. The Commission should somehow deal with all the emerging issues and I would like to see in Romania that people do not think anymore we have two Europe, ie the so-called Western Europe and the Eastern Europe, ie the Member States that joined since 2004. I would like the Romanian Presidency to be the one in which, definitively, we can prove that the European Union must not have anymore a differentiated treatment for the Member States. The Commission, the European Parliament, their members speak with nuances about what is being done in the Member States and it may sometimes be considered a sign of division, but the Commission, in fact, without exception, regards all the Member States as equal. Viorica Dăncilă: Yes, I believe that the anti-European messages do not find response among population if the European institutions, Brussels give adequate responses to the challenges we are facing. That is why we want, alongside the Commission, and the Council, to give answers as close as possible to the citizens so that we can show that the only path is the pro-European path. An anti-European message remains only a message, if citizens find themselves in the policies coming from Europe. I believe that it is very important how we respond to the existing challenges, how, through the policies that we are going to adopt, European citizens will find themselves, and then I think any anti-European message will remain unanswered. This is what we aim at, therefore, in the program of the Romanian Presidency of the Council of the European Union, we chose cohesion as a European common value, in order to have the same response, the same treatment for all EU Member States and all European citizens. And I think that in order to avoid the increase of extremism, and to avoid new anti-European reactions, we must mobilize ourselves and provide adequate answers, answers awaited by the Romanian and European citizens. I think this is the path we have to take. Reporter: Mr. President Juncker, you stated in late December to a German newspaper : „I think the Bucharest Executive has not fully understood what means to preside over the EU countries”. Do you consider your statement then as a rushed one, given your talks in Bucharest last evening and this morning, with Romanian partners? Do you still maintain this statement and perhaps, you are willing to clarify it on this occasion. And if it comes to clarifications, you stated earlier that at present, your wish is that Romania is accepted in the Schengen Area in the term of the current Commission, and also that you are in contact with the Prime Ministers and the states that at present are a bit more obstinate in this matter. How would you persuade Netherlands and the Dutch Prime Minister to accept Romania in the Schengen area? Jean –Claude Juncker: I usually do not comment the statements I made on other occasion. I talked frankly with the German publication, you answered yourself in fact your question by laying stress on the efforts needed to reach national consensus in your country, on the eve of taking over the presidency, which happened on January 1, and following my talks with Mrs. Prime Minister, I am reassured, otherwise, following my discussion with the President too. I trust that domestic issues will not be reflected at European level, because that would be harmful. But following my talks including with the President of the Senate and the Deputy Speaker of the Chamber of Deputies, I have confidence that this message was well- understood. The second question pertaining to Schengen, I would ask you to follow what I said during my press conference with the President. I repeated what I kept on saying from 2014 on, that Romania must be in the Schengen area and I will do my best for this to happen during the term of the current Commission. In connection with Netherlands, I have an ongoing dialogue with Netherlands and with the other countries as well, telling that Romania met all technical criteria for Schengen accession. The Dutch Prime Minister is aware of this and he knows I expect him to make progress in Netherlands and elsewhere too, on this topic. Reporter: Good afternoon! I have a question in connection with migration.Lately, some member states received 49 migrants, after the member states faced the issue of who would take care of them. What should be done to avoid such situations through the reform of course, of the Dublin Regulation. And in connection with this issue, given the elections for the European Parliament, yesterday, the Hungarian Prime Minister, Mr. Orban said he would want most of the parties entering the European Parliament to be parties that oppose migration. Do you think such a majority will be formed? Jean Claude Juncker: As regards the first question, if the member states had adopted in due time all the Commission’s proposals regarding migration, we would not have faced the current situation. I am dealing with this issue every week, on a daily basis, and I hail the efforts of the Romanian Government, of the Romanian Prime Minister who accepted few migrants and refugees to come to Romania. It is a decision that honors Romania. In connection with the alleged statement of Mr. Orban, I would first check it before any comment on it. Reporter: A question for Prime Minister from the “The Times”. The legislative window for the Multiannual Financial Framework is quite narrow given the context of these negotiations because a major net contributor is lost. How will this issue also be addressed? And cohesion is a central area, a central issue, of your presidency, how do you promote cohesion in the MFF context? In the context in which net contributors such as the Netherlands simply refuse to contribute more to cover the hole left behind by Brexit? Viorica Dăncilă: I know there are divergent views on the Multiannual Financial Framework and in my speech, I pointed out the fact that according to the way we address the Multiannual Financial Framework, this will be reflected in the cohesion policy, the common agricultural policy, traditional policies at the EU level. As we know, at the last European Council it was decided that in October we would have a political agreement on the MFF. We do not have to wait for October.We need to consider small steps that we have to take, but thorough steps in order to obtain this political agreement. And to us, as rotating presidency, it is important not only the time frame in which we will have this political agreement but also what the MFF contains, as we may get a political agreement in shorter time , but it may not refect what we all want: a strong cohesion policy, a strong agricultural policy in which we can find the other policies as well, I am talking about the defence policy, the migration policy you have just mentioned, the single market, also the counter-terrorism policy, and other policies of interest at European level. Therefore, it is important more for us what MFF will include than the time frame when we can get a political agreement. But, of course, during the six-month period, we will have talks with all member states, we will be impartial mediators and we will try to reach consensus on the Multiannual Financial Framework.